Gluckman Tang Architects was the only American firm out of eight finalists in an international competition that featured the world’s foremost architecture firms. 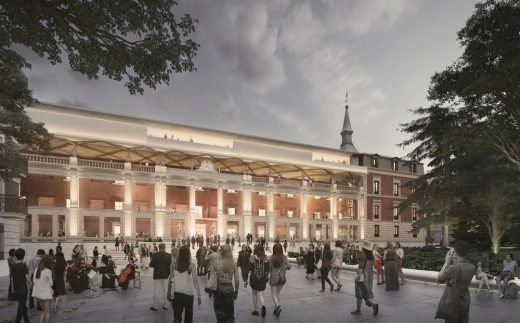 NEW YORK, NY, November 28, 2016 – After an international design competition, Gluckman Tang Architects has released its design for the Museo del Prado’s new expansion into the Hall of Realms. Gluckman Tang was the only American firm on the final shortlist of eight teams asked to reimagine this former wing of a 17th-century palace, which was acquired by the Prado in 2015. All proposals will be on display at the Prado beginning on December 1, 2016. “While the role of the museum today is still to preserve, present, and educate, it also acts as an armature or facilitator for new ways to interpret, discover, and compare art from diverse origins and typologies,” explains Richard Gluckman, FAIA. “In the Hall of Realms, or Salón de Reinos, we had the opportunity to frame a great program in an historic building with multiple narratives that our design made use of, edited, and complemented. Gluckman Tang was pleased to associate with the offices Estudio Álvarez-Sala, S.L.P., and Arquitectura Enguita y Lasso de la Vega, S.L.P., for the competition.’” The winning team was Foster + Partners and Rubio Arquitectura. Gluckman Tang Architects is one of the most sought-after museum architecture firms in the world. Among the historic structures that have benefited from the firm’s sensitive renovations are the Museo Picasso Málaga and the Andy Warhol Museum. In New York, the firm’s thoughtful approach is evident in the Staten Island Museum and the Andrew Carnegie Mansion for the Cooper Hewitt, Smithsonian Design Museum. The Prado competition, which began with an open call for entries, sought architects with experience transforming older buildings into museums to redesign the Hall of Realms. With the addition of the Hall of Realms, the Prado gains more than 8,000 square feet of exhibition space and 9,500 square feet of supporting space. 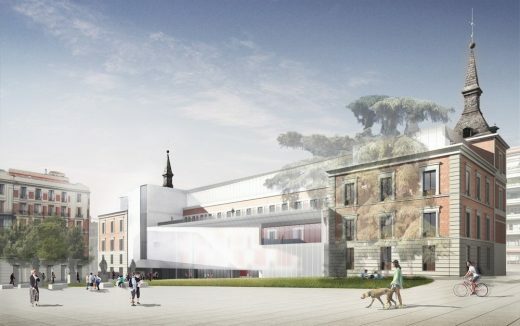 “Our transformation is an intervention that introduces clear access, circulation, and orientation, with a new exhibition venue at the top of the building, expanding the curatorial imperative of the Prado. It is a transformation that celebrates the past, animates the present, and anticipates the future, transforming the 19th-century museum model into a 21st-century version worthy of one of the world’s great art institutions,” says Gluckman. Historically used by Spanish royalty, the Hall of Realms most recently housed the Museo del Ejército, or Army Museum, before becoming a part of the Prado in October 2015. Gluckman Tang’s competition design for the Salón de Reinos allows the Prado to re-contextualize its collections within a building of historic and cultural importance. The new context is not only a frame for this grand obligation but also a lens into the relationship between the art and the cultures that nurture it. Gluckman Tang’s design for the project replaces early 20th-century infill with a contemporary intervention that repurposes and realigns the forced symmetry of the 19th-century military museum, supporting a historic narrative that eases the transition from the 17th century to the 21st-century intervention. A new atrium creates a celebratory space that defines the orientation and circulation strategies of the new museum: the basic diagram locates art venues at the top two floors and ancillary functions on the three lower floors. The primary route is clear and simple: the visitor ascends to the Primera Planta, the historic Hall of Realms from the original palace; from there, the visitor ascends to new exhibition galleries at the top floor. The addition maximizes natural light and mutable space, enhancing the curatorial imperative of the Prado. Gluckman Tang were one of eight architects shortlisted for this international design competition.